“STANDING IN THE SHADE”…. a 3-part book series that follows the life of Dianna M Williams. From the beginning to the very dramatic ending…. filled with the reveal of emotional and mental abuse, sexual molestation, bullying, isolation, hurt and pain and how it turned into the worst SHADE possible to be thrown…. the book speaks candidly of people, places and things that have helped and hurt….. it’s MY truth that I’ve suppressed it as i was made to feel unworthy to be heard… the story of my life was so hard to speak on that the memories brought back immense tears, resentment and anger but doing this book set me free….. some things I’ve never said out loud but it’s time these people know just how much they hurt and how some helped me….. It’s The Shady Business, The Shade of it All, The Tea and the Shade and the woman who stood in it ALL and took it blow by blow…… each book expounds on the spoils of my life and shows how and why Dianna is who she is…. talks of the True start of the Dolls, Dollhouse, Bring It (fully detailed accounts 😊) and Bring It Live!! This 3-part series is sure to make you think, cringe, cry, empathize, worry, feel happy, be inspired and feel empowered…… I have my story to tell…. I’ve allowed to many to be the author of my story, now it’s my turn, i have the pen now……. be sure to watch my page each day as more details will emerge….. forever transparent 📚✏️. Dollhouse Jackson has all the action!!! The original Dollhouse Dane Factory currently has over 100 dancers entering the doors weekly. The excitement of dancing inside the Dollhouse hasn’t changed on bit!!! With 5 excited staff members the Dollhouse is always jumping!!! The DH1 I where Lifetime’s Bring It has been filmed since season 1. . Ready to enroll???? Call the office and ask for Jleesa!!!! The Dolls have had a world wind of the last 4 years. Being featured and filmed for TV is quite the experience and very competitive. The Dolls have won over 375 trophies and over Grand Champion titles!! Their FIREY Coach, Mrs. Dianna Williams has always been a force!!!! 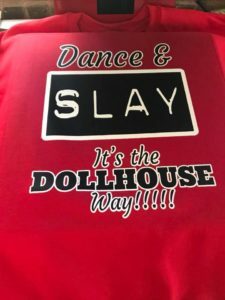 New additions to the DD4L Coaching Staff are Coach Katt (former Doll Captain & former Alcorn Sate Golden Girl) and Coach Cipreuna (former JSU Prancing J-Sette) . Wanna be a Doll in Jackson?? The time is coming soon!! Dolls of Jackson have auditions in February 2019!!! BUCK OR DIE 2019 is in full planning swing!!! Registration opens in 1 week!!!!! Registration Fee: $50 per division Due at Registration..Regular Registration ends December 15, 2018 & Late Registration begins $100 per division. New Categories & New Division added !! 1) BUCK OR DIE STADIUM ENTRANCE…. every REAL majorette has watched dancers stomp, strut and prance into the stadium!! Well here is your chance to show us exactly how your team enters a real stadium!! Showcase your signature style as you enter a REAL stadium!! Dancers are judged on costume choice, signature strut, choreography, visuals and showmanship. 2) 8- Count Girl! So many Piggy back off Bring It but are you a real 8- Count team!? The creativity is in the 8 count, the finesse in the way it’s thrown, the way it travels thru the team and more! Dancers will be IN THE STANDS so pull out your marching boots and let’s go! Here’s the catch…. only 14 dancers are allowed in the stands and must be split into 3 rows… captain down front, row 1- four dancers, row 2- five dancers and row 3 four dancers…. special prize for BEST CAPTAIN AND BEST TAIL! 3) BUCK OR DIE SWAC FIELD SHOW… instead of in a gym dancers will perform ON THE FIELD! Get creative and let’s see how well you are able to slay the field!!!! Here’s the catch, ONLY BAND MUSIC ALLOWED!!! Each team must have an intro, a field show and a sideline routine to exit. Make it good because you only have FOUR MINUTES! Buck Or Die 2019 is in full swing!! !